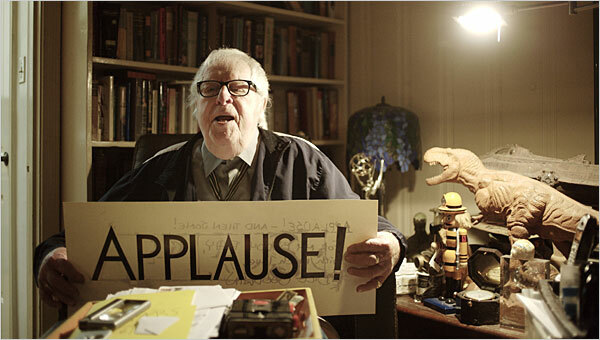 Tyrannosaurus Ranch: RAY BRADBURY: 1920-FOREVER! When Ray Bradbury was a boy, a traveling carnival pitched its tent in a field outside the town in which he lived. Like all carnivals in those days this one had a sideshow featuring acts like the tattooed man, the bearded lady, the skeleton man, etc. Also present was a defrocked Methodist minister who went by the name Mr. Electrico. Mr. Electrico's act consisted of him being strapped into an electric chair and electrocuted. Sparks of electricity would shoot from Mr. Electrico's head and hands. He would then grab a wand (really just a conductive metal rod) and wave it over the crowd, sparks jumping from the wand to the carnival-goers in the first row. Among those seated near the stage was a young Ray Bradbury. However, instead of merely passing the wand over Ray, Mr. Electrico paused and pointed the wand directly at his head. At Ray Bradbury's 90th Birthday. "LIve forever!" He shouted at the young boy who would grow up to write such classics as The Illustrated Man, The October Country, Something Wicked this Way Comes, The Martian Chronicles, and Fahrenheit 451. Ray Bradbury is one year closer to fulfilling Mr. Electrico's command. He turns 91 today. Happy birthday, Ray. Live Forever!